He even shook hands with Prince Charles when the heir to the throne visited a relief centre. A serial fraudster was jailed Friday after pretending that his family were killed in London's Grenfell Tower fire disaster in order to claim relief funds. Anh Nhu Nguyen, 53, was jailed for 21 months at London's Southwark Crown Court. His two-week campaign of deceit saw him receive around £11,270 ($15,540) from charities and the Kensington and Chelsea Council local authority. He told family liaison officers how he and his family wrapped themselves in sheets and towels before he lost sight of them in the smoke-clogged stairwell. He claimed his wife and son had been killed. He does not have a wife or son and actually lived on the other side of London. Vietnam-born Nguyen even shook hands with Prince Charles when the heir to the throne visited a relief centre. Nguyen obtained two laptops, a mobile phone, food, clothes and toiletries as well as cash. "You knew full well what you were doing, you knew that you were taking advantage of these genuine victims at this terrible time of this terrible tragedy," judge Philip Bartle said. Nguyen has been in Britain since the 1980s and has 17 aliases. He has 28 previous convictions for 56 offences spanning more than 30 years -- 26 of which were matters of fraud and dishonesty. Nguyen's other offences include theft, arson and grievous bodily harm. In November, he admitted two counts of fraud by false representation and one count of making an untrue statement for the purpose of obtaining a passport. Bartle said Nguyen would serve half his sentence in jail. He has already spent seven months in custody, meaning he could be released in mid-May. The fire in a residential block in west London claimed 71 lives. 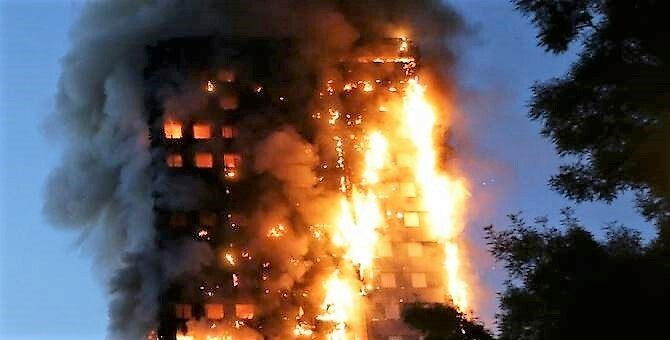 The blaze, which started with a faulty refrigerator on the fourth floor, engulfed the 24-storey west London tower in the early hours of June 14, rapidly spreading up the new cladding on the outside. "What this man did was crass beyond words," said Kim Taylor-Smith, the local council's deputy leader, adding that they had referred "several cases of fraud" to the police. Officers said he went to great lengths to fabricate his story. "Not only did Nguyen take money, housing and clothing intended for genuine victims, he diverted police time and resources away from those who most needed it," said Detective Superintendent Matt Bonner.